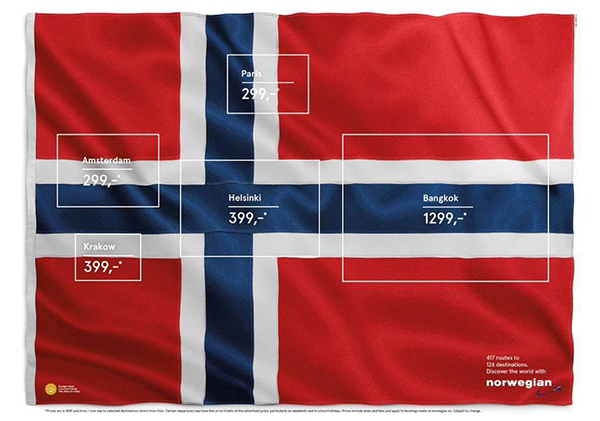 “The flag of Flags”, Norwegian Airlines. I love the simplicity of this ad for Norwegian Airlines by M&C Saatchi Stockholm. They have taken the Norwegian flag and outlined the flags of countries they fly to. Each flag is maked by a simple white outline and a destination name for that country and the cost of a flight there. Thailand, France, Finland, Poland and the Netherlands. The campaign is called “The flag of Flags” and plays to the Norwegian national pride for their flag. The print ad was featured in The Newspapers VG and Aftenposten over the holidays and during the New Years issue for each. Posted in Advertising, Design and Art and tagged Advertising, Aftenposten, Design, Flag, Graphic Design, M&C Saatchi, Norwegian Airlines, travel on February 11, 2015 by Author. ← Mill+ and Phillip Stein Watches.